I love my new closet. We recently renovated our house. One of the great new features is having my own closet. Previously, I shared a closet with my wife. She is very small, but, like Barbie, she has a lot of accessories. Barbie had her own house. Ken had to keep all his stuff in his car. So you can imagine the challenge in sharing a closet with my wife. 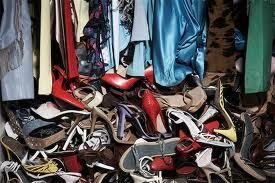 I was always trying to defend my turf from the onslaught of shoes and handbags. It was difficult to defend my space with primarily T-shirts and underwear, even though I haven’t thrown any out since high school. They don’t take up enough space. I have to fill up my new closet quickly before she grows out of hers. Already she sees it as a good landing area for joint property such as pillows or Costco-sized boxes of toothpaste and soap. I have retaliated with 15 years of Chelsea programs and all of my Sports Illustrated’s from 1968-1973. Plus three dozen Brooks Brothers white button-down shirts dating back to 1980 (they never go out of style!). Then there are my 10 pairs of unworn khaki pants with waists ranging from 34 to 40. And my 10 Frank Lampard Chelsea shirts. Several jars of pennies. Shoe boxes filled with used golf tees and ball markers. But it’s still not enough, so I am thinking about getting a Barcalounger and a big screen TV. And a lock. Any ideas? Can you help me? Our closet is full of the thirty-some Barbies your daughters passed along to my daughter. My daughter cut their hair off, colored the stubble with neon marker pens, removed some of the dolls’ limbs, and abandoned them. My mother tried to devalue Barbies, which she considered to be undesirable, by banning them from the family premises. I didn’t have to do that. Owing to the number of birthday parties your girls had in NJ before moving to London, we took the Weimar Republic approach to devaluing Barbies: Barbie inflation. It was much more effective. Now, if only they weren’t still in the closet. Maybe I’ll throw them out. Or perhaps you’d like them back, to fill up yours? Sounds like Barbie genocide. Please give them a humane burial. Absolutely. Dust to dust. Er….